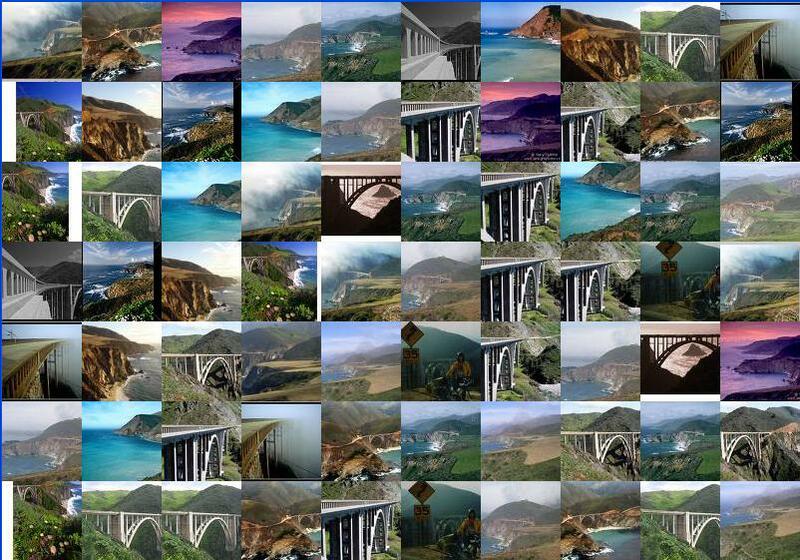 Montage-a-google is a simple web-based app that uses Google's image search to generate a large gridded montage of images based on keywords (search terms) entered by the user. A click on any image (max 20 images, scattered with dups over a 9x12 grid) takes you to the source of the image. The grid size can be fiddled with, as can other features using the "advanced" mode. You'll need Flash player version 8 (or up) to run the app. If you want to save your results, use [alt][print scrn] (if you use a PC -- don't talk to me about Mac stuff) to copy the image. Then pop the image into your photo app with ^V and clear the bits you don't want before printing. Not bad for a first try. I could've trimmed the edges better but I won't go back and fiddle some more because at some point conscientiousness veers into compulsiveness and we're not exactly creating lasting art here. Google search for "bixby creek" "big sur"
Check out the photos tagged with "montage-a-google" on Flickr.